Polar bears are the largest bear species and they feed on ringed and bearded seals. Bears are opportunistic hunters and will eat just about anything ranging from whale carcass to the live walrus. Changes in weather conditions force polar bears not to rely on particular diet. Favorite among the polar bear diet is a seal which is an essential source for providing fats. Bears need fats to spend months in starvation during denning. The adult polar bear loves to consume seal’s blubber to build up fat reserves. The carcass if often left for other arctic animals to feed on. Let’s study now what do polar bears eat in the wild. What Do Polar Bears Eat in the Wild? 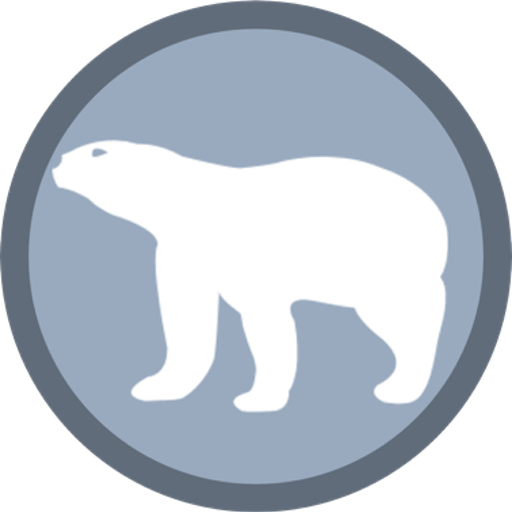 Polar bears are the largest terrestrial land carnivores. Animals (other than seals) do not form the regular part of polar bear’s diet. Bears occasionally feed on carcasses of ravens, arctic foxes, or whales when the seals are scarce. The reason behind is that the supplementary foods do not provide enough calories for bears to survive the intense cold of the Arctic. The massive polar bear’s size means that they must hunt animals that are not only large enough to feed the entire family unit–they should be rich in fat reserves and calories too. What Food Do Polar Bears Eat? Polar bears are hypercarnivorous bears that is, more than 70% of their diet consists of meat. White bears consume adult ringed and bearded seals but their pups also become part of the diet. 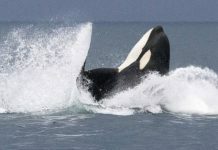 They are thought to feed on animal’s carcasses including beluga whale carcass, walrus carcass, and bowhead whale carcass. While there is a regional variety in bear’s diet ringed seals are the most common victim. It accounts for 75% of the polar bear’s diet. Bearded seals on the other hand make up 20% of the entire bear’s diet. The percentage ratio of other seal species is 50% in harp seals and 8% in hooded seals. Bearded seals make up 20% of the entire bear’s diet. The percentage ratio of other seal species is 50% in harp seals and 8% in hooded seals. The young seals up to the age of 5 years are most likely to be killed. In ringed seals, bears typically prey on pups because adult seals know how to avoid polar bears. However the female ringed seals become more vulnerable (than before) when they move with their pups. In order to nurse their pups the seals must enter the lair. Polar bears can detect the smell of seals in the lair. During spring polar bears can enjoy the fresh meal of both male and female ringed seals. Sometimes it so happens that adult seals forces their young to live in habitats that are not completely safe from predators. The juveniles soon become the easy access to polar bears. Unlike young bears adult polar bears often feast on adult walrus and bearded seals. The adult walrus is nearly the size of an adult polar bear. Therefore young bears cannot afford to attack these animals. Sometimes an adult bearded seal become a real challenge for female polar bears. Young bears rely on subadult harbor and ringed seals. The carcasses of walrus, narwhals, belugas, and ravens only contribute 10% to the bear’s food. That is not to say that an adult polar bear has to consume all these animals in a year. It is just an average estimate of a bear’s diet. A single bear can only eat one animal species in a year and it is suffice for its growth. How Long Can Polar Bears go without Eating? Polar bears have got the ability to spend months without eating. It’s a pretty tough ask especially for mother bears because they must feed their cubs no matter what. In a BBC Documentary with David Attenborough one female polar bear starves for as long as 5 months before she could find her first meal. During this period polar bears make use of their available fat. What Do Polar Bears Eat in Summer? Bears are also known to eat birds’ eggs. This is probably a short-term adaptation because polar bears spend several months on land and they must eat something to survive. 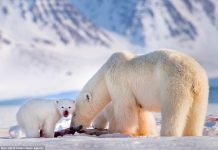 Scientists have come up with the recent findings that polar bears fancy eating goose eggs and other ground-nesting birds. These foods offer energy-rich diet and it makes up the deficiency of food shortage. However scientists also believe that if the entire polar bears were to rely on goose eggs then the geese will become extinct. Polar bears have been forced to search alternate food because the ice disappears earlier each year. These prey animals include offshore species such as Aves, Anatidae, Anserinae, Mergus serrator, common eider, Melanitta perspicillata, snow goose, Canada goose, American black duck, Eurasian teal, Northern pintail, red-breasted merganser, Passeriformes, Plectrophenax nivalis, deer, muskrat, meadow vole, lagomorpha, starfish, insects, grass Leymus arenarius, mushrooms, and mosses. What Do Polar Bears Mainly Eat in the Tundra? Polar bears prefer adult ringed seals over their pups because adults offer 24 times as much energy. An adult seal contains 150,000 kcal. This means that if a bear preys on adult ringed seal she can afford to spend next 6 days without eating. However if a polar bear hunts a beluga whale she can afford to go by 6 months in fasting. The young seals do possess blubber but it is not thick enough to provide sufficient energy to adult bears. That is something big bears know—they know it all too well. A big fatty bear often (not always) leaves the newborn pups for other skinny bears to feed on. She can afford to be a little selective. However if polar bears couldn’t find blubber they will take as much protein as they possibly can. Unlike wild polar bears, the captive bears are most likely to be fed with dog food as well as commercial omnivore pellets. Breeders believe that the captive polar bear’s diet must contain 58 – 60% dry food. However one can supplement few other dietary items just to add variety and also to provide nutritional enrichment. The remaining 40% of the diet is thought to contain vegetables, fish, and fruits. Prominent among fish includes trout, caplin, and herring. Let us not forget that there other factors that play significant role in raising polar bears in captivity. Factors such as size, weight, and age influence the dietary behavior of an animal. One of the specimens living in the Brookfield Zoo (Illinois) is likely to be fed with vegetables, dry food, meat, fish, and fruits. Probably yes! Polar bears predominantly feed on seals which makes them the most carnivorous member of the bear family. 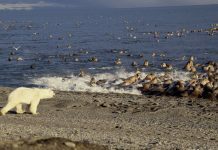 However observations show that polar bears, though occasionally, also consume some vegetation, grasses, plants, and marine algae including fruits such as berries and kelp. They are also thought to feed on human garbage. In mammals the polar bear has the highest quantity of Vitamin A in its liver. However the quantity varies with the change in season. During summer, the quantity of Vitamin A ranges from 22,000 – 29,000 IU/ g liver while in winter the range is 13,000 to 18,000 IU/g liver. A mother Polar bear with her cub eating a dead carcass. 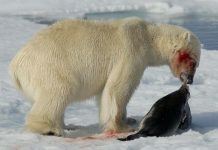 While polar bears usually avoid fighting each other they do nevertheless compete for eating the seal fat. If there is only one kill then adult polar bears will typically dominate the subadults. However in subadults each one of them snatches the meal from the other. They fight for the fats only because it possesses twice the energy of protein. Polar bears are known to leave the seal’s skin and muscle behind for scavengers. Biologists observed that bears consume 61 – 91% ringed seals and 32 – 89% bearded seals. They seem to share certain characteristic digestion with other carnivorous animals. Polar bears gobble down up to 98% of fat (in a blubber) which is stored in the stomach. What Do Polar Bears Eat and Drink? Other carnivores take in more than 95% of protein while polar bears assimilate up to 83% protein. Nonetheless, the food the polar bear eats remains in its stomach for a long time. Bears that have consumed blubber are least likely to feel thirst as compared to those who haven’t. This is because they take metabolic water from the burned fat. But if polar bears couldn’t eat blubber they must eat snow to make up the requirement of water. However there is a price for snow-eating. The cold snow must be warmed with the body temperature which indeed takes a lot of energy from bear. What Animals Do Polar Bears Eat?